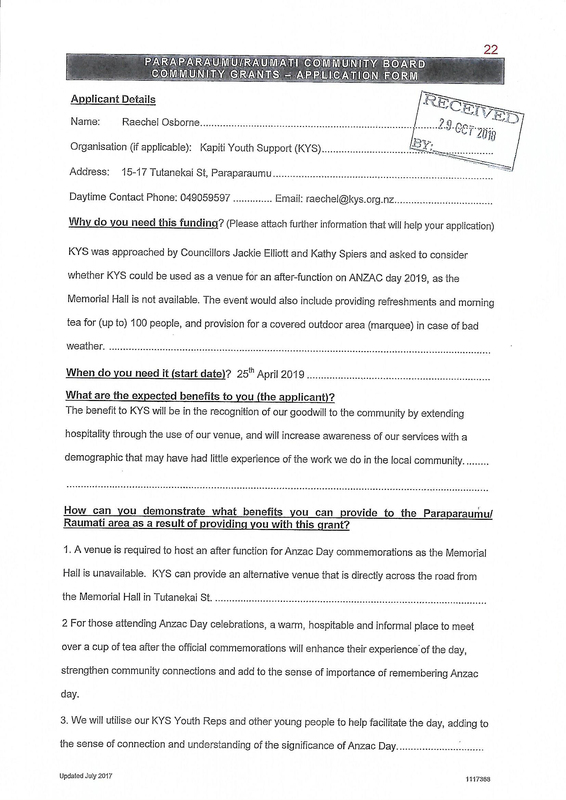 We met with Kathy Spiers of the PRCB today who wanted to tell us about the split vote last Tuesday night for an allocation of $3,581 for Kapiti Youth Support to meet the costs of after-function hospitality for attendees at a service next ANZAC Day, as detailed in the application shown. The application was organised by Kathy Spiers and Cr Elliott, and was supported by Bernie Randall and Guy Burns — but opposed by Jonny Best, Cr Vining and Cr Benton. Their reaction was that this was paying for a “$35 cup of tea.” Jonny Best as Chair had the casting vote. Once all the applications for funding had been heard, Kathy Spiers walked out in disgust. Bernie Randall rang the mayor and told him that he should talk to Kathy Spiers. He did and asked her if she was OK. She replied that she had never felt better over her action. She pointed out to us that there is still $21,000 allocated in their grants budget and with only 3 more meetings scheduled in the current financial year, it’s unlikely that all of it will be used for any other applications. If it is not allocated, it goes back to the consolidated KCDC funds: it doesn’t add anything to what the KCDC budget has already provided for and thus doesn’t cost ratepayers any more. ANZAC Day is an important day in the country’s calendar and is there to show respect for the sacrifices made by servicepeople and their families. It’s likely that the majority of NZers have a father, grandfather, uncle or granduncle who served in a conflict overseas. Some may not have returned; others may have returned damaged physically or mentally. Although we have often criticised wasteful spending by the council on such things as out-of-town consultants and lawyers, over-payments to contractors and unnecessary staff, the amounts involved have been in the hundreds of thousands of dollars. This was a mere $3,581 — its rejection is just miserly. We’re told that the application has been held over to the next PRCB meeting. The trite cost/benefit ($35 per cup of tea) applied in opposing the KYS application fails entirely to factor in the incalcuable intrinsic value of the intergenerational contact (on and after Anzac day) that hosting by KYS would create. KYS is an international model of providing services to disadvantaged youth. here we have a youth group wanting to show their acknowledgement of the War sacrifices made, by providing refreshments to those attending the ANZAC service and at the same time raise a little money for the cash strapped KYS. They are giving their time free, donating it to KYS. Councillors Vining and Benton happily have paid out to Zeal $1.3 million for advantaged youth but flaunt their so called “fiscal responsibility” by saying $35.00 is too much for a cup of tea. So it is, though 300 may attend at $11.50 a cup. But this is about a time for inter-generation reflecting, on ANZAC day in a community setting with young people showing their enthusiasm by giving of their time to benefit many. Just as fallen comrades gave themselves for us all.